Promotion: BUY 2 GET USD30 OFF! 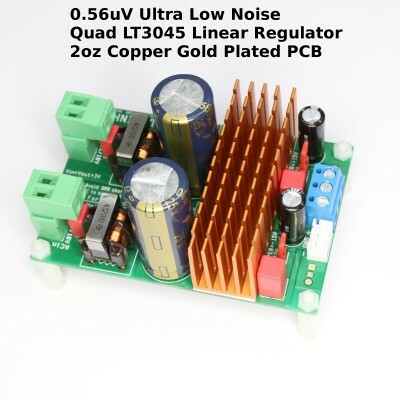 This item includes PCB with Linear Technology latest LT3045 ultralow noise regulator in parallel on each rail to achieve 0.56uV low noise performance. *All SMT component are soldered, thru-hole component are not soldered. 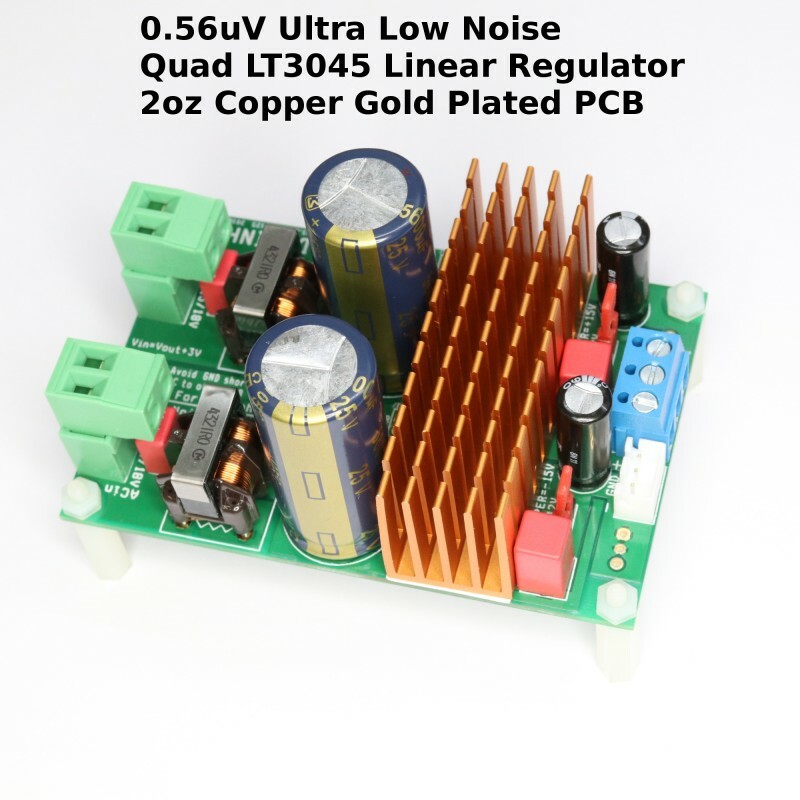 This is the best ultralow noise power supply regulator for Diyer to enjoy, use of decade old 78xx / lm3xx /lt10xx is simply kidding for audiophiles. This regulator PCB is equipped with high quality hybrid choke coil and CRC input filter to remove the common mode noise and differential mode noise from the input and provide the best sound result from time to time. It is always a mystery for most people why the same DAC usually sound better at night. The reason is the noise pollution through the AC line from all the other equipment in the same room. In the day time, More electronic equipment turn on and there are more pollution. 1)Linear Technology 0.56uV ultralow noise quad LT3045 regulator in parallel. 3) 18 thermal via are placed directly under the chip for maximum thermal transfer to the large copper area. High quality 3M 8810(sourced from digikey) adhesive thermal transfer tape are used for maximum thermal path to the heatsink. 4)Fixed value thin film resistor is used to set the output voltage, it is more solid stable against vibration and temperture change than thick film resistor(much cheaper) or variable resistor used commonly in the market. 6)Two individual 9V/12V/15V 1A(upto 2A*2 if six LT3045 is installed) rail switchable with a jumper easily. Please notes 1A(2A)*2 is the burst value, please read the bottom notes for output usage larger than 0.5A continuously, additional voltage set resistor must also be added if six LT3045 is installed. 7)The PCB follows the official demo circuit for ultimate performance. 1) Double check the polarity of the 5600uF capacitor is correct before connect AC power input to the PCB, the capacitor will explode immediately if it is reversed connected. No return is accepted after the pcb is soldered. 2) Attention: Don't remove the voltage switch jumper when the pcb is using. The output voltage will jump to 7V when the jumper is removed and it may causes damage to the load if it is using 3.3V. 3) Cut JP1(copper trace) on the top side and the PCB can be use as two individual rail. For linear regulator, all unused voltage is converted to heat, if the PCB is used for output larger than 0.5A current continuously, depends on the room temperture and the input voltage, larger heatsink and fan is needed. The same usage method is applied to all linear regulator in the market. The operating temperature should always keep below the rated maximum operating temperature as listed in the manufacturer official datasheet. The murata EMI filter used in the PCB is rated 1A at 60degrees celsius from the manufacturer. As most modern DAC uses less than 1A per rail, we choose the highest inductance in the series. The filter can actually deliver larger than 1A if it can keep below 60degree. The PCB can also delivery larger than 1A if the temperature can keep low. User can bypass the emi filter easily by a wire short it's input and output soldering pad. As the PCB can actually output higher than 1A, the first overheat component will be the input choke, the second is the full bridge diode rectifier. The LT3045 has internal current limit and overheat protection will survive. If the operating temperature is too high, user should bypass or replace the EMI filter with lower inductance in the series which generate less heat but the drawback is less noise filtered.